As I listen to British radio plays on Audible, I pretend I am walking the streets of London, hearing familiar voices intoning the accent – and laughing out loud with a favorite British author. The plays are short enough to hear in a sitting – or, if I am motivated, on a short walk. Alan Bennett’s short radio play on Audible – Say Something Happened – confronts the same difficult topic in audio as Roz Chast attacked in cartoon form in Can’t We Talk About Something More Pleasant? June Potter, a trainee social worker, visits an elderly couple to collect information for a government survey on old people. Of course, the couple have their own opinions on being old, and turn the tables on June, offering her advice on how to improve her life. A few sad moments reveal their relationship with their children, and when June asks who would take care of them – say something happened – it’s clear they only have each other. June’s solution to the problem is hilarious in its typical government approach. With Bennett’s flair for humor, this short piece will have you laughing and crying, as he addresses the dilemma of growing old. Related Review: Can’t We Talk About Something More Pleasant? This seventeenth century Restoration play by William Wycherley has Maggie Smith playing the title heroine, with wry asides and bawdy humor. Listening to the subtle innuendo, it’s easy to imagine her in a role she made famous on the British stage as Mrs. Margery Pinchwife. Harry Horner, a rakish bachelor, pretends to be impotent to gain the trust of his fellows and access to their wives. When newlywed Margery Pinchwife comes on the scene, the action gets fast and furious with disguises and fast exits – as funny as a Marx Bothers movie. Margery is dissatisfied with her stuffy husband, and tries for a second husband. You need to listen carefully to catch all the complicated twists, but, even if you miss a few, Maggie Smith will keep your attention. We all die eventually, right? And, with a little luck – or not, depending on our state of health – we may live to a very old age. But most of us would prefer to be in denial about death, old age, debilitating illness, and any talk about the inevitable future. 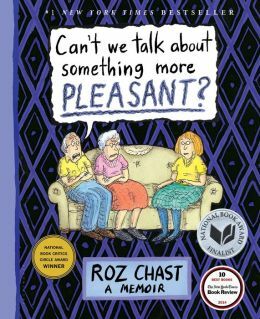 Roz Chast, cartoonist for The New Yorker, addresses these uncomfortable issues with grace and humor in her graphic novel/memoir – Can’t We Talk About Something More Pleasant? If you have lived through the agonizing ritual of watching your elderly parents decline and die, Chast’s comments may offer some comfort when you realize you are not alone in your conflict of resentment vs caring. Issues of her parents’ slow decline, their resistance to change and to any discussion about change, despite their increasing inability to manage ordinary tasks – are handled with poignant humor. I laughed out loud at some of Chast’s punch lines, but also cringed a little at how close she had come to knowing how I had felt when dealing with my own 94 year old mother. Could it be Chast has discovered some universal truth about aging daughters with elderly parents? Whether or not you have experienced Chast’s story of watching her parents age well into their nineties and die, her story of human behavior and parent-child relationships has the notes of humor, nostalgia, guilt, and love easily relatable to anyone. You may be crying at times – but mostly you will be laughing – maybe at yourself. Can’t We Talk About Something More Pleasant? has that Dr. Seuss quality of delivering truth with a good dose of reality, as you smile through the drawings and words of wisdom. You’re all going to die. It’s okay. The story revolves around three main characters and a mannequin: Millie Bird, a seven year old with an unusual interest in death – abandoned by her widowed mother in the ladies underwear department; Karl the Touch Typist, an elderly refugee from assisted living, still mourning the death of his wife; Agatha Pantha, an 82 year old recluse, bitter over the death of her unfaithful husband; and Manny, the life-sized store dummy dressed in an Aloha shirt. 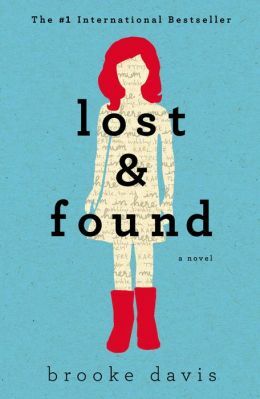 The four fugitives connect and start a road trip in search of Millie’s mother. Led by the perspicacious Millie, who has dubbed herself superhero Captain Funeral, the elders discover strength in breaking the rules – they are not dead yet. As she changes voices, from the wise young heroine to the two adventurous elderly protectors, Davis observes and philosophizes about old age and death – and inserts a variety of irreverent scenes for comic relief. The ending is hopeful and realistic, but not happy. Davis includes her journal article “Relearning the World” in the appendix of this short tale (289 pages), offering clear insights into her mindset as she wrote the book. Telling the story as a seven year old gave her permission to be funny and quirky while revealing a thoughtful perspective on a difficult topic.